Now I know what to ask for if I get a sketch from you. Move over Han Solo and Buck Rogers, there's a new sci-fi swashbuckler in town. 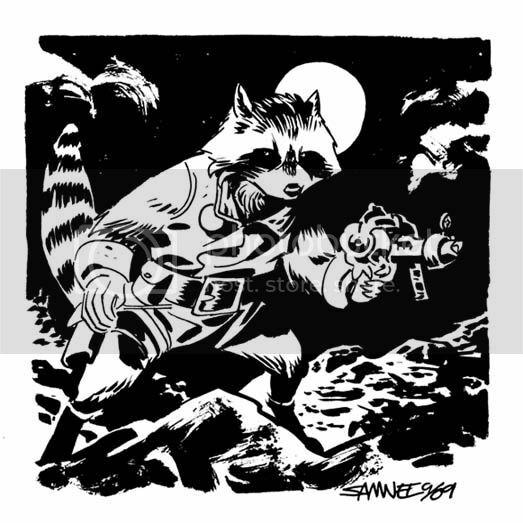 Who would have thought that a raccoon could look so formidable. Great stuff, Chris! Ah, that's a good 'un sir. I've loved R.R. since I first saw him in an old Hulk comic back '82. Almost as awsome as Howard the duck. Rocket Raccoon always brings a smile to my face. Great job, Chris! I am so glad to now own this!